A WOMAN who has made it her mission to tackle loneliness says she is delighted to have launched her third community cafe. Gillian Flower, famed for her work in setting up Bristol Community Friendship Club, came up with the idea of opening a cafe once a week where people could meet up, take part in activities and make friends. 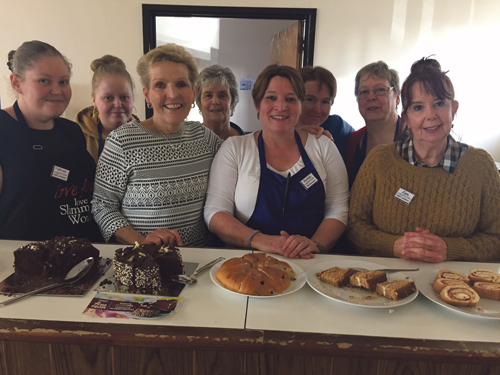 With the help of her daughter, Michelle Ford, she launched her first cafe in Longwell Green last September and her second in Speedwell the following month. Her third cafe now takes place at Kingswood Community Centre, opposite the former Linden Hotel, every Thursday from 12-3pm. Visitors can pop along and buy a cuppa and a cake or sandwich meal deal and try craft activities. A 50p table holds bric-a-brac bargains that can be snapped up and there's music, games and a tombola as well as an area for young parents and their children. Gillian, who lives in St George, and Michelle spread the word by handing out leaflets in Kings Chase shopping centre the day before the first Kingswood cafe launched on January 17. When 80 people stepped through the door she was staggered - and delighted. Gillian makes sure either she or another volunteer is on hand to greet people as they come in as she knows it can be a big step for some people to make. Gillian said: "I didn’t wake up one morning and think I will spend every minute of every day and evening ending loneliness. I’ve been there and used to feel very lonely and disconnected from the community I live in and, at some time in our lives, we will all feel lonely. It maybe the death of someone you love or retirement. Young mums tell me they go to their local shop to talk to another adult human being. Loneliness is nothing to be ashamed of. It is what you do about it that counts." Michelle, who lives in Hanham, is currently applying to get the community cafes registered as a charity. Running costs are funded by donations of clothing and household items which Gillian sells on her Facebook page, Bristol Community Cafes. Michelle manages volunteers and is always looking for new people to join her happy team. The cafe in Speedwell takes place every Monday from 11-2pm at Barton Hill Rugby Club, Duncombe Lane, BS15 1NS. On Fridays the cafe is held at Longwell Green Community Centre, Shellards Road, Longwell Green, BS30 9DU, from 12-3pm.